In Billy Rose’s Jumbo, Pop and Kitty Wonder are the owners of the Wonder Circus. Because of Pop’s gambling addiction, they’re constantly in debt, with creditors very close to foreclosing on them. Their main attraction is Jumbo the Elephant. Their competitor, John Noble, wants Jumbo and to take their show. Out of nowhere, a mysterious new wire walker named Sam Rawlins joins. Kitty is taken with him, but what they don’t know is that he is Noble’s son. ﻿﻿﻿ For the record, I’d like to say that I enjoyed Billy Rose’s Jumbo very much. But, not for the reasons that you may think. As a rule, I enjoy circus movies, and this definitely counts. I’m a large fan of Jimmy Durante, and he delivers in Billy Rose’s Jumbo As does Martha Raye; in fact, her romance with Jimmy Durante is one of the highlights of the film for me. The circus acts are very good, with actual performers such as Poodles Hanneford. I should also mention that the circus montage toward the end of the film is absolutely entertaining. And the clown skits are hilarious! Doris Day does a good job as the daughter of the circus owner, trying to keep them solvent. Her singing is as lovely as ever, Stephen Boyd does a good job as the new man who keeps rescuing the circus. And buying it, piecemeal, from their creditors. And Dean Jagger does a fine job as Mr. Noble, who cares more about destroying a rival than his son’s happiness. Having said all of that, the romance between Stephen Boyd and Doris Day simply doesn’t work for me. They’re both good performers, but the romance seems unreal and artificial. Unlike Jimmy Durante and Martha Raye’s romance. As I say, I do enjoy Billy Rose’s Jumbo, and I hope that you do too. I only wish that I had enjoyed it a little bit more. Anthony ‘Pop’ Wonder (Jimmy Durante, The Great Rupert). Jimmy Durante does a wonderful job of making the audience like, and root for, Pop Wonder. No small task, since Pop gambles away the circus’ money while stringing along Lulu. Lulu (Martha Raye, Keep ‘Em Flying). A Jacqueline-of-all-trades at the circus. She has been dating Pop for a long time, and waiting (mostly) patiently for a proposal. Which she actually gets when Pop is injured, and thinks he’s dying. He’s not, and goes through with the wedding regardless; they truly do love each other. Sam Rawlins (Stephen Boyd, Fantastic Voyage). The roustabout who shows up out of nowhere, looking for a job with the Wonder circus. At first he’s rebuffed, but saves the day substituting for the wire walker. And saves it again, helping Kitting “win” back Pop’s losses in gambling. And she starts falling in love with him, and he with her. But … He’s John Noble’s son, and he’s been buying the Wonder circus, bit by bit, from their creditors. And he feels like a heel about it. John Noble (Dean Jagger, White Christmas). Pop Wonder’s rival, who’s been buying up smaller circuses to merge with his own. And he wants the Wonder circus – badly. Badly enough that he doesn’t care about hurting performers, or about his son’s feelings for Kitty. Jumbo is a mighty talented elephant. It’s also the ideal word to describe this big-time, big-top extravaganza bursting with laughter and love, sang and dance, circus stunts and star power. Radiant Doris Day sings beloved Rodgers and Hart tunes and does her own horseback riding tricks in a razzle-dazzle musical based on Billy Rose’s stage spectacular and featuring circus sequences directed by Busby Berkeley. 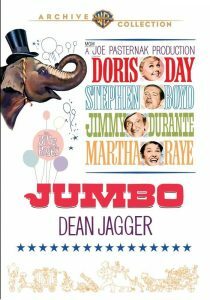 The story revolves around a circus owner (Jimmy Durante, star of the 1935 Broadway original) with only two real attractions: his daughter (Day) and popular pachyderm Jumbo. Three-ring pandemonium breaks out when a handsome rival (Stephen Boyd) infiltrates the circus, and father, daughter and Dad’s wise-cracking fiancé (Martha Raye) are suddenly at risk of losing the greatest show on earth!